Citing your sources during your project -- not just at the end -- is an essential habit. Fortunately, citation management tools like NoodleTools make it so easy! Citation and bibliography manager. On the right side of the login screen use your full Carolina Friends email address and click "Sign in with Google". 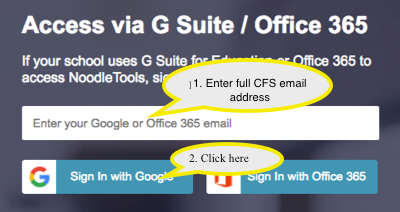 Use your full CFS email address and click Sign in with Google . Add collaborators using their full MB email address. To export citations from Gale databases (All of the "In Context" databases) to NoodleTools, make sure pop-ups are ENABLED. In Safari, go to "Preferences"
Uncheck the pop-up blocker box. At top right, click "More"
At the bottom, click "Show Advanced Settings"
Under "privacy", click 'Content Settings"
Under "Pop-ups", select option: "Allow all sites to show pop-ups."